Any day of the week . . . any month of the year . . . there is always a walk in Tanger Family Bicentennial Garden waiting for you. That is if you find yourself in Greensboro, North Carolina. Whether it is exercise or a stroll through to enjoy the gardens, it is always a good idea. The 7.5 acre garden was established in 1976 as part of Greensboro’s bicentennial celebration. Through sculpture and restored buildings it serves also as a memorial to David Caldwell (1725 – 1824) and those students who would have attended his college on the adjacent property in the late 18th and early 19th century. For more garden history go here. The main garden is handicap accessible. The wild flower garden is accessible with some assistance, but there are a few steps and hills. Lastly, make sure not to miss the Camberly Garden which is in honor of Camberly Holliday, the daughter of former Greensboro Mayor. For more on garden features go here. While you are at Tanger, don’t miss the Bog Garden at Benjamin Park that is just across the street (handicap accessible). The Starry Night is a post-impressionist painting by Vincent van Gogh, a Dutch painter. It portrays the view from his window in June 1889. 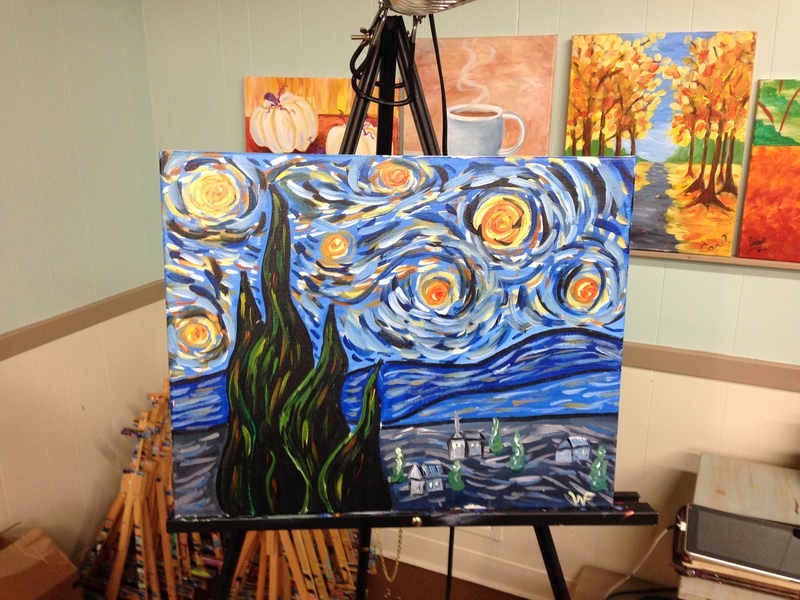 Circa September 2014, it was a starry night at Wine and Design in Greensboro. Jordan facilitated the soundtrack and guided our paintbrushes to create our own views of the starry night. The original work can be viewed (if Wikipedia is up to date) at the MoMA in New York City. To paint your own starry night or other masterpiece in just a few short hours, check out your own class at Wine and Design. Locations across North Carolina.